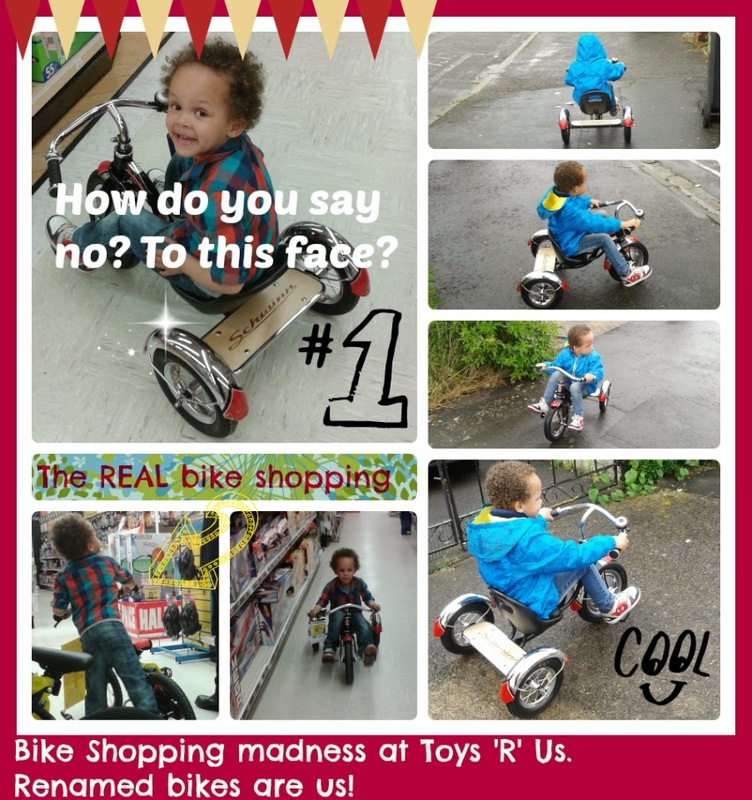 New Mum Online: Bike Shopping Madness - After The Balance Bike What's Next? Bike Shopping Madness - After The Balance Bike What's Next? Aaron's had a balance bike since last Summer. He goes everywhere on it including free wheeling down slopes on it, with his feet in the air - it literally has given him wings wheels! It means I can walk very long distances without the obligatory toddler "I'm tired carry me!" which we used to get pre-scooter. (The balance bike was not the 1st set of wheels for this outgoing adventurous wee fella). Anyhow it's been evident to Daddy for the longest time, that Aaron's legs were too long for the balance bike, but frugal me was resisting the urge to do anything about it. In the real world, we ought to have waited for his birthday which is 6 weeks away, but he literally looks on longingly (I am talking about the small man now, not Daddy) when he sees a big boy whizz passed on a bike, and sometimes utters the words "I want pedals". We grabbed the bull by the horn yesterday, and went to my least favourite shop: Toys 'R' Us. Luckily it wasn't our usual branch, so I did not have the life sucked out of me as I entered, and came out alive, still with a spring in my step. With Daddy's pocket all the lighter, as we bought TWO bikes. Aaron told me on the way home "now we have five". I was confused, as a balance bike + 2 new ones, makes 3, but I was too exhausted from shopping to argue, and as he is always right, I knew it was pointless. The penny has only dropped as I write this post. Our shed now has Mummy's bike, Daddy's bike, the balance bike and 2 new bikes. Aaron's mathematical skills at the age of 3 are intact. That makes FIVE! Anyhow, we went in for a pedal bike. Me and Daddy had "words" as he wanted stabilizers and I am DEAD against them. Would defeat the object of him having been a whizz on a balance bike for 10 months. The lovely staff advised we get a 16 inch, and we had no idea (till we saw the TV adverts that night) that we snapped up a bargain as it was half price. 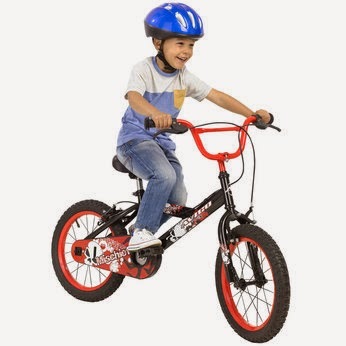 We got the Avigo 16 inch Mischief Bike in red. It really is beautiful. I can't speak for its performance as he is yet to ride it. But while we were choosing a helmet, errrmmm, Aaron found a bike that was left in the aisle, and as he whizzed around on it, and looked so happy we bought that too. It's all bling bling, like the Mini Cooper of bikes. It looks like a Go Kart but technically it is a trike. It's here: Schwinn Roadster Trike. I can't possibly tell you how much we spent *gulps* as we got the extended warranty on the 16 inch bike and an expensive helmet, and paid to have both bikes built for us. NO don't add it up!!!!!!!!!!!!! I am not going to. Suffice to say, his birthday presents in a few weeks (from us at least) are going to be small. Something from the pound shop perhaps! Eeeek. Last night saw a very stressed Aaron going to bed, as he was worried he'd have to ride and master his big boy bike today. 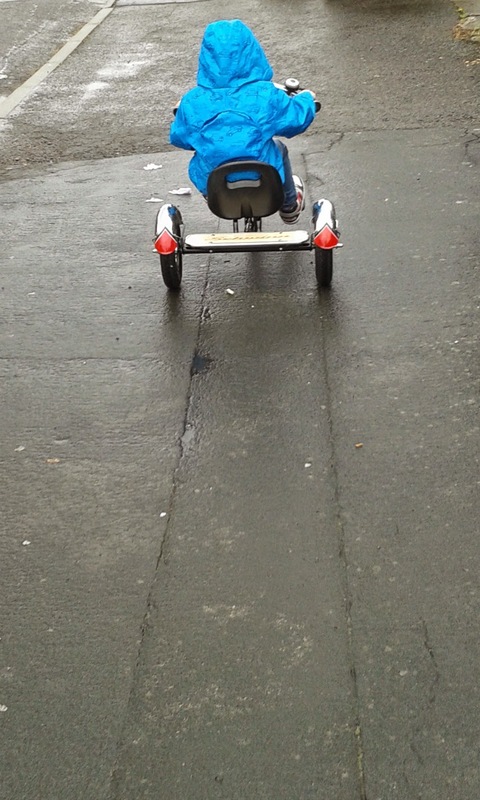 He smiled and slept soundly when I said he could ride to school on his trike, and THAT he did, in the RAIN! I KNEW he would pick it up due to the balance bike experience but THAT quick. WOW!!!!! So he has basically just learned, out with Daddy, this evening, how to ride THIS. Pics to follow (this one's from Toys R Us), when I get out with him tomorrow. How happy does he look?!? Wow, that's a pretty amazing transition. I'm with you on the no stabilisers, and that's why N has a balance bike. He's had it since he was 2, so I'm hoping he'll have grown enough by the summer to be able to reach the ground on his cousin's old bike, so he can learn on a proper bike as I think he'll be ready by then. But no way will he learn in an hour. The trike looks brilliant, so retro. Well done Aaron for getting two new toys! Aww well done. We made the mistake of going from balance bike to stabilisers. This looks like great fun. In a few years I think Max would love a go on this. That is one super cool trike!! I really need to get my 3 out riding their bikes a bit more often too - balance bikes sound like the perfect start for little ones. Such a cool trike!! My little girl who is 5 only a few weeks ago has just started riding her bike without any stabilizers!! It took over a month of tantrums and frustration but she got there in the end!! I love that trike and WOW how quick was that for mastering the bike! Gaaaa Love his little face!